The Spy Wall Listening Device is the Ultimate when it comes to Partition Spy Monitors. Offering the user the latest technology made from high quality materials. You can use the wall contact Microphone for wall contact situations or you can use the 5inch probe to insert into a drilled hole in a wall. 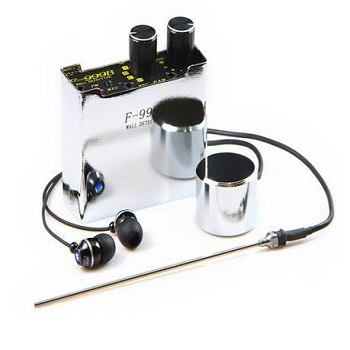 The Spy Wall Listening Device is highly sensitive and is equipped with high quality headphones and an FM receiver for bug transmitter capability. You can even record the sounds and conversations picked up by this Listening Device by using the jack plug output on the face. It has a volume dial and a gear wheel with a 4 stage power incriment.These Spy Devices work on stud walls, steel walls, floors etc but also on Concrete and block walls so these are really advanced. Put the earplug into headphone hole, the sonde into the MIC hole, and clockwise rotate the "switch on/off" button of the volume. When the indicator light of the power works, booth the machine and adjust the volume, smoothly stick the sonde to wall the need to be monitored, adjust the gear-choice buttons A B C until you can clearly hear the sound from the room. If you need to do the sound recording, you can use recording equipments to go through the mouth of the recoding to connect the audio cable for recording. Also, It's has another special FM wireless emission function, with specialized FM receiver which can receive the information afar and monitor that. The indicator light works when it is charging please shutdown in case of damaging the machine. It needs to charge for about five hours. The sonde must smoothly stick to the wall's surface; Never move the sonde when you are sticking it to the wall in case of damaging the sonde. The effect of the monitoring depends on the thickness, materials and other features of the wall. Appropriately adjust the gear-choice button until you can get the best effect of monitoring. D is the partition monitoring bougie of the sonde is the refined part which should not be dismantled or touched discretionarily.